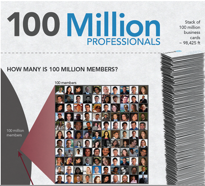 2011 has proven to be a monumental year so far for professional social network LinkedIn. The company filed its S-1 for a public offering, released a number of data-focused products and unveiled a social news reader for professionals. And today, the professional social network has hit an important milestone: 100 million users. LinkedIn, which launched in 2003, says that it is now being used in over 200 countries, with more than half of its users originating from outside the U.S. To be exact, the U.S. has 44 million LinkedIn members, and there are 56 million members outside of the U.S. Brazil is seeing the highest growth rate, with new user adoption rising 428 percent year-over-year. Mexico is also seeing major growth, with membership growing by 178 percent year-over-year. Currently 17.8 million LinkedIn users a members of the network’s Groups and 1.2 million post comments to Groups weekly. There are now over 2 million company pages, with eBay, Amazon, Apple, Cisco, EMC and Campbells as the most represented companies on the network based on the number of employees that are on LinkedIn. There are now 1.3+ billion connections between LinkedIn’s members and 79+ million job transitions/changes tracked on the network. So while 100 million users is an impressive milestone, the company admits that its active users are below this number. How much below, however, is unclear. According to comScore, LinkedIn saw 71.5 million unique visitors worldwide in February.